Welcome to the Oakland Ice Center's "Learn to Skate" Program - a challenging, rewarding and fun way to learn the sports of Hockey & Skating! We offer group skating lessons for ages 3 to Adult, all with exceptional student to teacher ratios. Group instruction includes a 30 minute class and 30 minute supervised practice. Each skater will receive a pin upon completion of each level, and a certificate of completion for each class (Skating Classes Only). Skating Classes are designed to take participants from beginning steps through advanced Freestyle levels. Hockey Classes are for Beginner through Advanced levels, with each class focusing on skill development, positional play and FUN! Our Spring Class Lesson Series On NOW! CURRENTLY WE ARE NOT OFFERING THE "ONE TIME GIVE IT A TRY" OPTION. Skate rental is NOT included in the enrollment fee. Participants without skates are able to purchase discounted skate rental coupons for their classes! Students should arrive at least 15 minutes before class. It is recommended that new students skate one time before their lesson to become accustomed to the ice and determine the proper size of skates. 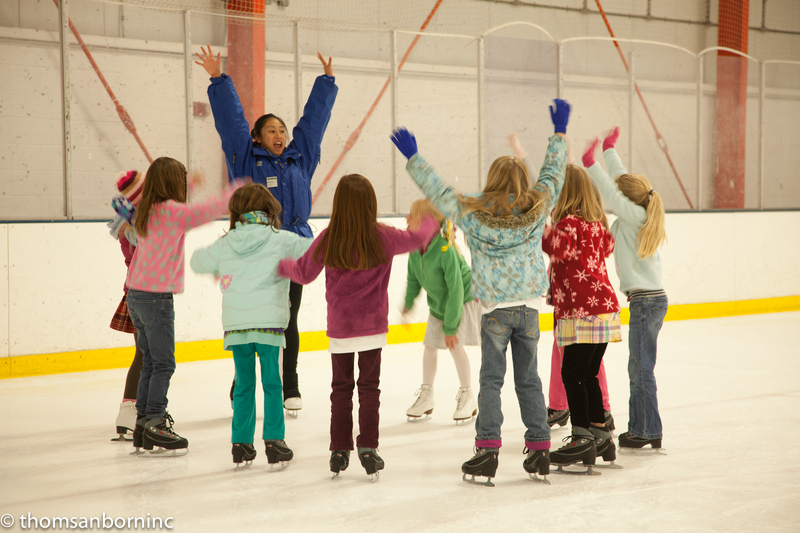 All Skating Class students should wear warm clothing, gloves and clothes that allow them to move easily on the ice. Helmets are always recommended, especially for children six and under. Arrive early for the first three weeks of classes to accommodate the check-in and registration process. PLEASE NOTE THAT PARENTS/CAREGIVERS ARE NOT ALLOWED ON THE ICE FOR OUR REGULAR TOT CLASSES. WE DO NOT OFFER MAKE UP CLASSES OR REFUNDS! For first time skaters, children and adults, attending a public session is the best way to introduce your future skater to the Oakland Ice Center. Please register your child in the appropriate skate lever for their abilities. We reserve the option to move skater to the level best suited for their skills. This is a fun class for one Parent/Guardian and one child to learn to ice skate together. For very beginning skaters who need the security of having their parent on the ice with them. Young Skaters build confidence through games and basic skating instruction. Children must be between the ages of 3 and 5. Cost includes one parent/guardian and one child. The parent must be on the ice, in skates, during the class. The one time trial class option has to be arranged with the Skating Manager before you arrive at the rink. This class is designed for the little ones who would like to try ice skating. They will learn the basics skating skills through playing games and building confidence on the ice. Proper attire is important. The skating school recommends gloves and a warm sweater. Please no snowsuits,ski jackets or elbow and shin pads. We encourage you to practice other than your lesson day. Please do not interrupt the instructors during class time. If you have a problem please speak to someone at the cashiers booth and they will be happy to help you. Parents are NEVER allowed to step on the ice during group lessons. PLEASE NOTE THAT WE DO NOT OFFER MAKE UP CLASSES OR REFUNDS! Starting with Adult Beginning class, beginners will progress at an individual rate while being challenged and motivated. Learn the basic elements of forward, backward, turns and stops before advancing to more challenging skating moves. No experience necessary – beginner through advanced welcome. Learn the basics to enjoy recreational skating or develop a solid foundation for learning more advanced skills. You may request rental hockey equipment free of charge or provide your own. Please select the option that applys to you. skills needed to speedskate at either a recreational or a competitive level. Speedskating is a family sport that is open to all ages. Synchronized skating or "synchro" is a specialized discipline of skating involving groups of eight or more skaters performing various group formations and maneuvers. The objective is for the team to perform as one unit executing circles, blocks, lines, wheels and intersections in unison to the music, while demonstrating quality edges, power and flow. Returning Members Click HERE to enroll. Please Note: NO walkers or assistant/aides are utilized for this class. The Oakland Ice Center operated by Sharks Ice is offering a Special Hockey program that is open to all skaters with developmental or physical challenges who would like to participate in hockey. With support and encouragement our program is adapted to the level of the ability of our participants. Emphasizing fun, safety, and team spirit, the Special Hockey program helps to improve balance and coordination which promotes an "I can do it" attitude that carries over into other aspects of the participant's life.With the assistance of volunteers, skaters develop skills, make new friends, and experience a new found freedom and sense of accomplishment. Our team practices on Friday evenings from 6:00 - 7:00 PM. On the first day all students should arrive at least 30 (thirty) minutes before class. Saturday morning 10:45 AM class students even earlier if you can. We have the highest volume of new students on Saturday’s and the line can be long at the desk. The first day is about organization for all of us and you and getting all of the skaters in to the correct class and/or level. This often can take a week or two to accomplish. Please tie the skates tightly and firmly. Skates run true to shoe size. A skate that is too big is never advisable. While we all want our skaters to start working on those doubles and triple jumps as soon as possible, please remember that a good, solid foundation comes first. Every coach on staff has excellent qualifications and many have made this a lifelong career. We all work in different ways to achieve the same results. Please do not block the doors to the ice. It impedes the flow of traffic for the skaters and coaches entering and exiting AND can be quite dangerous too. The doors should be closed at all times. Please do not interrupt the instructors while they are working. SKATE RENTAL is not included in the enrollment price. A discounted book of rental tickets may be purchased from the cashier. 18th & San Pablo Surface Lot: Parking is available in this lot for up to four hours, for a fee of $4 per hour. PARKING IS FREE IN THIS LOT ON SUNDAY.